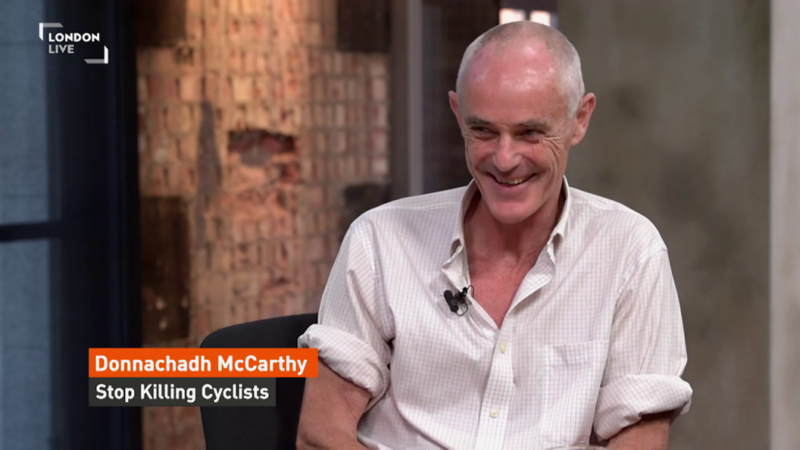 Donnachadh McCarthy on London Live TV’s ‘Headline Interviews’ programme in July 2015. Click the image to watch the full interview at London Live’s website. 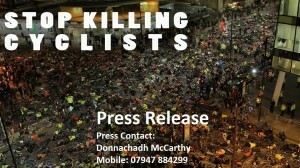 Donnachadh McCarthy, co-founder of Stop Killing Cyclists, has appeared on London Live TV as part of their ‘Headline Interview‘ series. 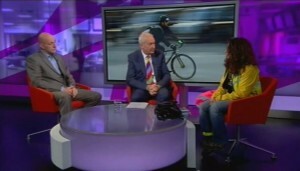 The interview begins with an overview of Donnachadh’s early career in ballet dancing and party politics; then from about 9 minutes in, Donnachadh discusses the impact of poor road infrastructure on the health of people, not only those who choose to cycle today but also people that walk and drive. 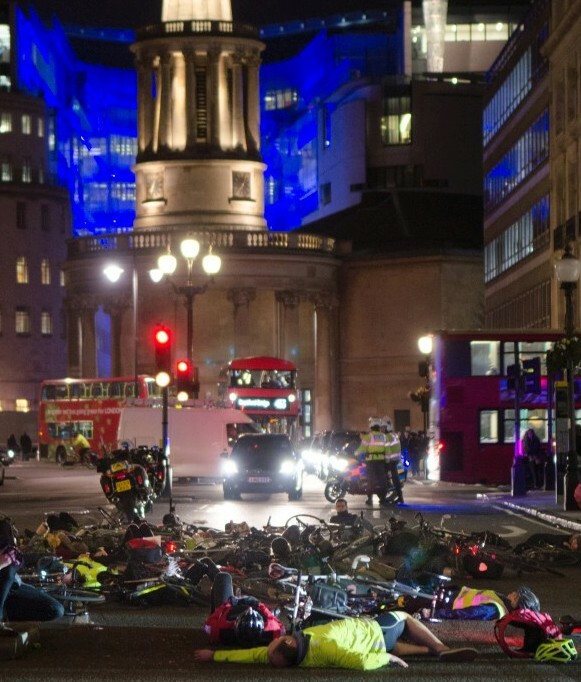 Cyclists are probably the smallest number of people who are dying on London streets. There’s around 100 pedestrians being killed every year…there are around 4000 people dying from pollution from our transport, there is around 3000 people dying from inactivity diseases. 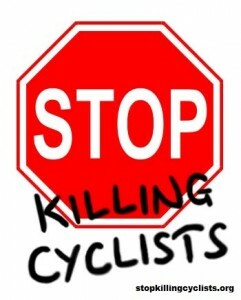 The campaign for Stop Killing Cyclists is actually to save the lives of 7000 others who are not cyclists. It is to benefit the health of all Londoners because all Londoners are breathing pollution, and there is something like 2/3 of Londoners who are unfit. The interview is on London Live HERE. 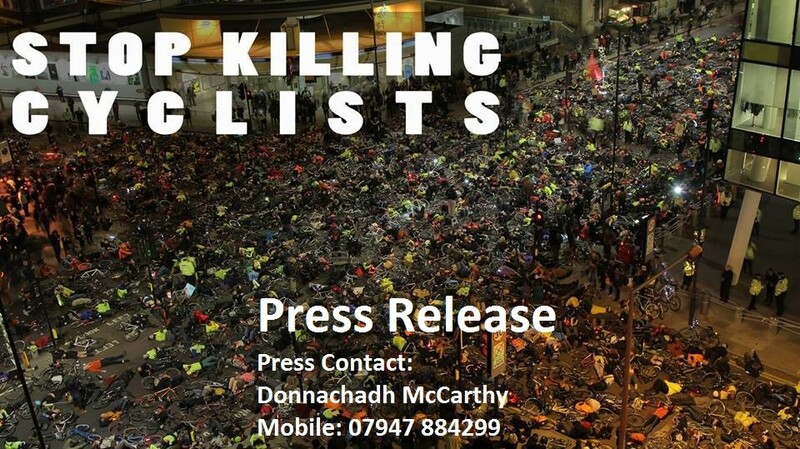 For the seventh time this year, Stop Killing Cyclists, the cycling activist group, will commemorate cyclists killed while riding their bicycles, with a Vigil and Die-In. The people being remembered are 60 year old Clifton James who was killed in Harrow after midnight on Sunday 21st and Ying Tao, who died as a result of her bicycle being hit by a lorry at Bank on the morning of Monday 22nd June. 5/ TfL and City of London to allocate 10% of transport budget to cycling infrastructure. Protesters are asked to bring candles and placards. The London Boroughs including the City of London are responsible for 95% of London’s roads, whereas the London Mayor and TfL control the remaining 5% i.e. the very large arterial routes. 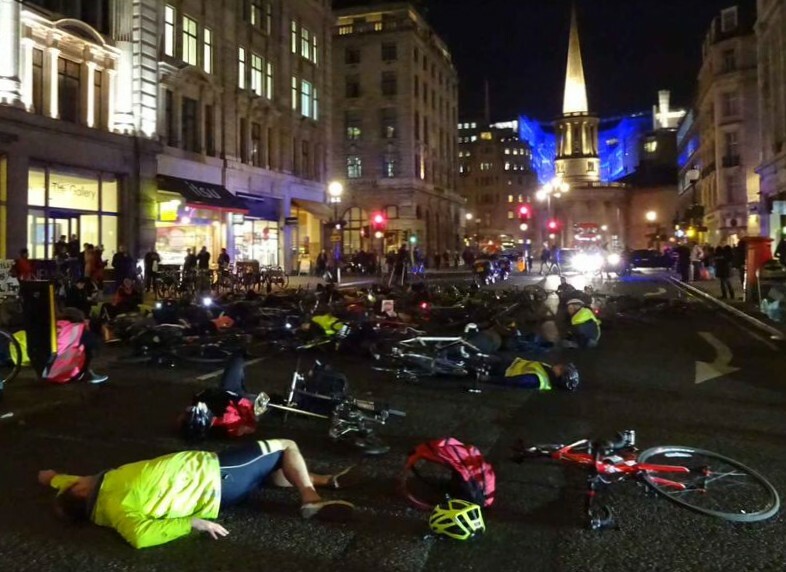 For the sixth time this year, Stop Killing Cyclists, the cycling activist group, will commemorate a person killed by a lorry while riding her bicycle, with a Vigil and Die-In. The person being remembered is 32 year old Esther Hartsilver, who died as a result of her bicycle being hit by a lorry on Denmark Hill at the junction with Orpheus Street just before 8am on Thursday, 28th May. Esther was on her way to Kings College Hospital where she worked in the Physiotherapy Department but very sadly died of her injuries at the hospital. 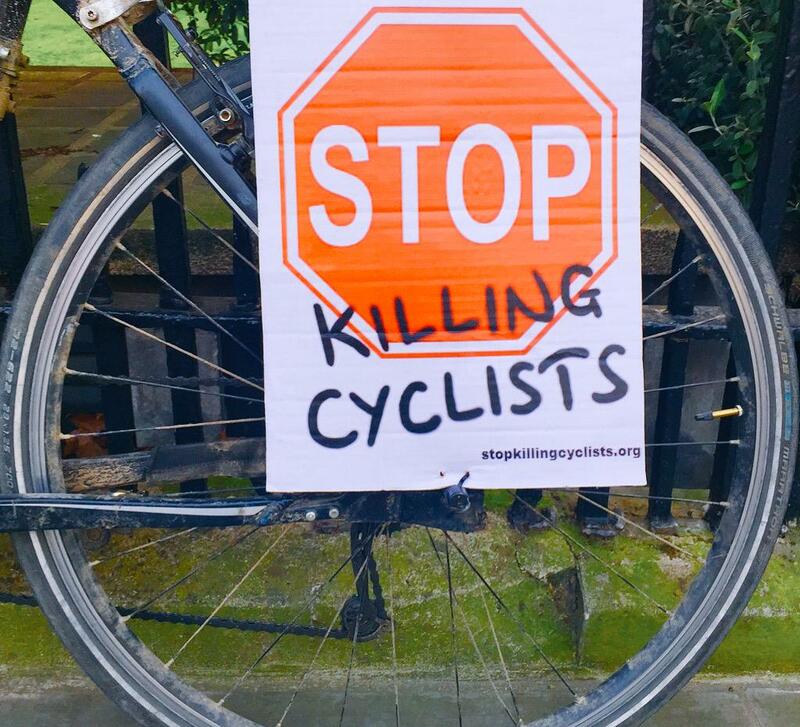 Stop Killing Cyclists will begin gathering from 6pm on Monday 8th June at Camberwell Green, and the vigil will formally start after 6.30pm. 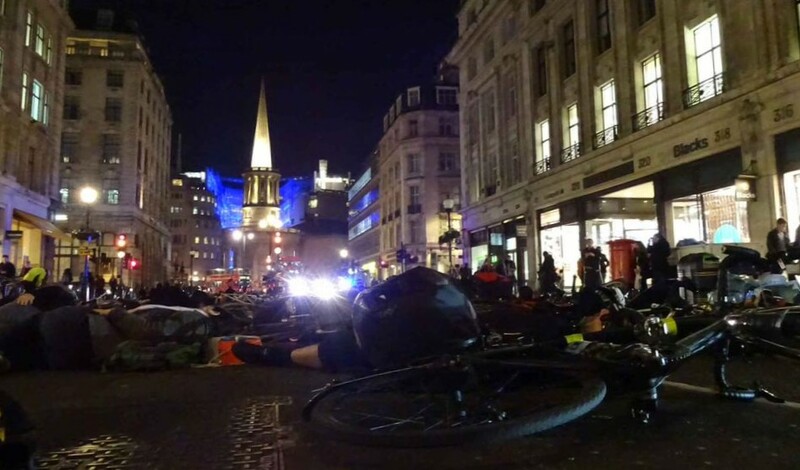 In this sadly increasingly familiar sight on the streets of London, short speeches will be given, candles lit, and flowers laid around a ghost bike in memory of Ms Hartsilver, before hundreds of people will lay on the road, many with their bikes. 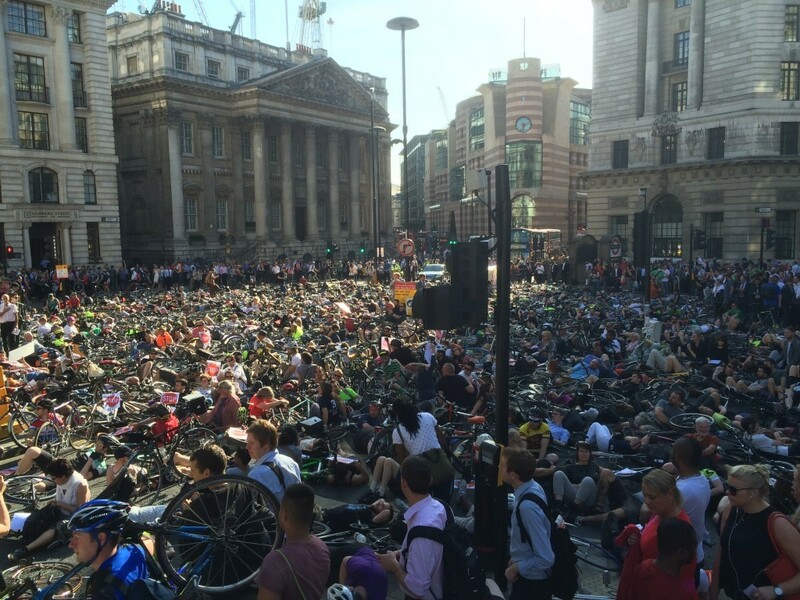 Traffic will be brought to a standstill for two minutes, and all will be given a space to contemplate the terrible price paid by Esther Hartsilver, and by cyclists and pedestrians killed and seriously injured on the streets of London. Southwark Council (LBS) is notorious for poor cycling provision, and must take responsibility, along with the construction industry, for this latest tragedy. They are complicit in her death. Southwark Council’s Transport Department proposed a by-pass two years ago to allow cyclists to avoid that junction by using Love Walk, but Deputy Leader Labour Cllr Ian Wingfield refused this proposal due to cyclists being according to him “a danger to pedestrians” – thus insisting all cyclists, including children to use the major junctions. Stop Killing Cyclists calls on Southwark Council and Transport for London to truly recognise that cycling must be a priority for road design and transport planning if London is to become a safe place for everyone to cycle, not just the fit and the brave, but the pensioner, the child, the parent taking children to school, the ordinary person going about their daily business. 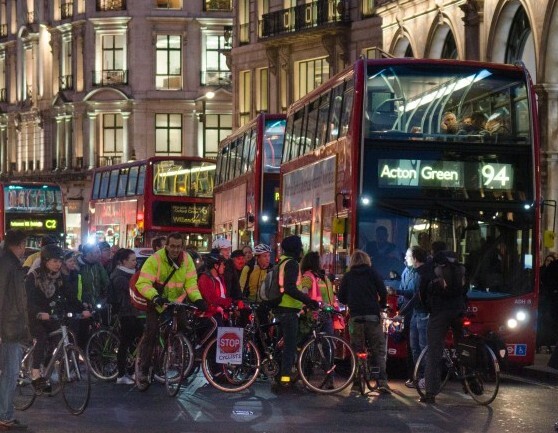 Transport for London must appoint cycling representatives to its board, to balance the representatives of the HGV and taxi industries. It should allocate 10% of its budget to cycling provision, and ensure that every facet of road maintenance, building and planning considers the needs of people to cycle. Southwark Council must take immediate action to provide protected lanes for people who cycle in this busy borough. No money has been spent on segregated cycle lanes in the borough in 4 years, with LBS having deleted ALL cycle provision proposals in the Peckham & Camberwell Action Plan. Camberwell Green Junction is being refurbished and Southwark Council are refusing to include safe protected left hand turns for cyclists. 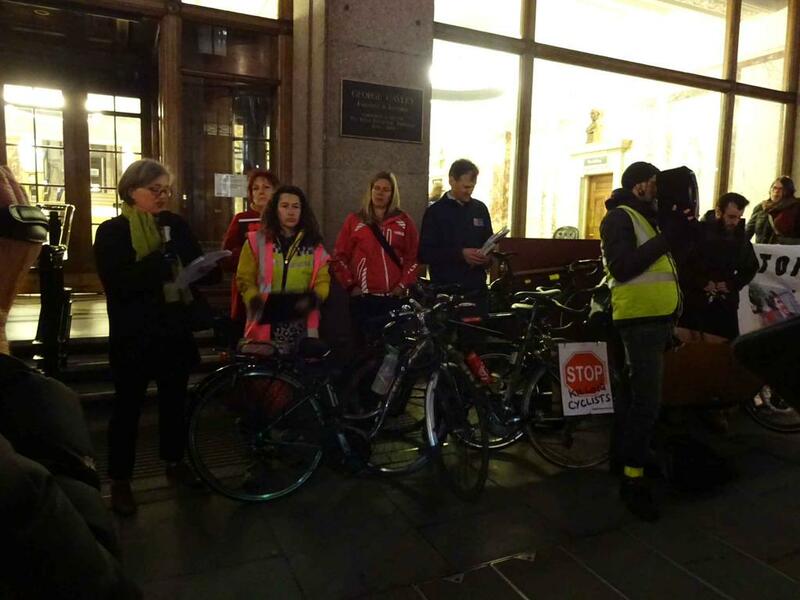 We call on LBS to reverse their policy on both Camberwell Green and the junction where Esther Hartsilver was killed IMMEDIATELY. It is criminal not to make improvements. 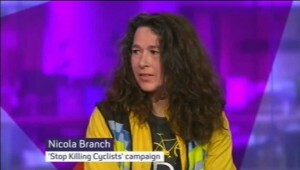 See http://www.nhs.uk/news/2014/02february/pages/cycling-safety-a-special-report.aspx for statistics re the health benefits of riding a bike and what needs to be done to cut down the cost to the country through KSIs. 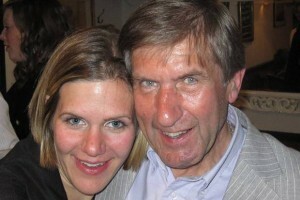 Michael Mason, 70, was killed on Regent Street in 2013 when struck by a person driving a car. 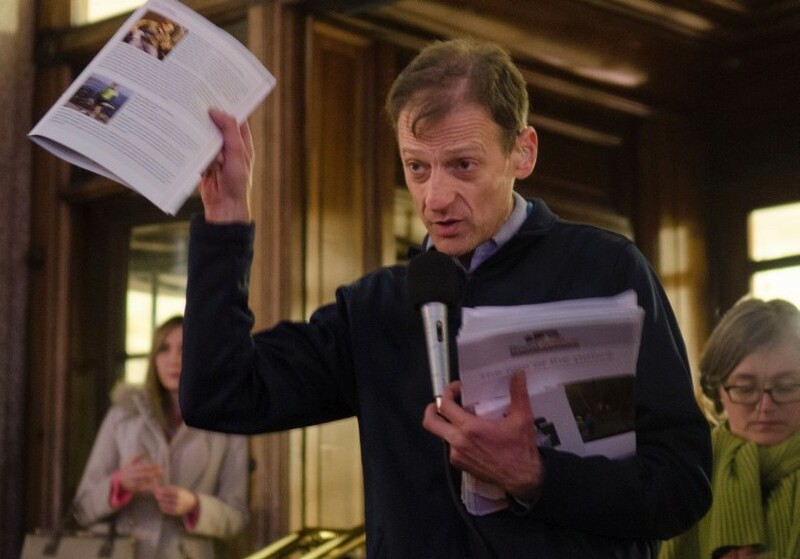 On Friday, 13 March 2015, a ride, vigil and Die-In was held in conjunction with the Cyclist’s Defence Fund to remember Michael Mason who was killed in a crash on Regent Street a year earlier. 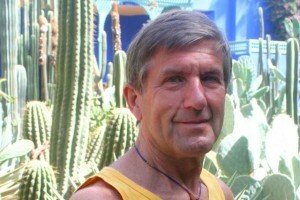 Mick was hit from behind by a car on 25 February 2014 and died in hospital 19 days later. The ride and vigil remembered not just Mick but also the many other people who have lost their lives on London’s roads and across the UK. Thank you to everyone who came along tonight, particularly all the speakers, and especially to Mick’s daughter Anna Tatton Brown – a very powerful and moving speech. Also thank you again to the Met police who stopped the traffic, esp Seargent Paul Findlater who made sure all his officers took their caps off during the 2 minutes silence. The coup of the night being so very welcome at All Souls Church, where we had great food, listened to wonderful Jazz music and our vigil and die-in and the message to make the roads safer for all, young and old, was incorporated into the sermon. 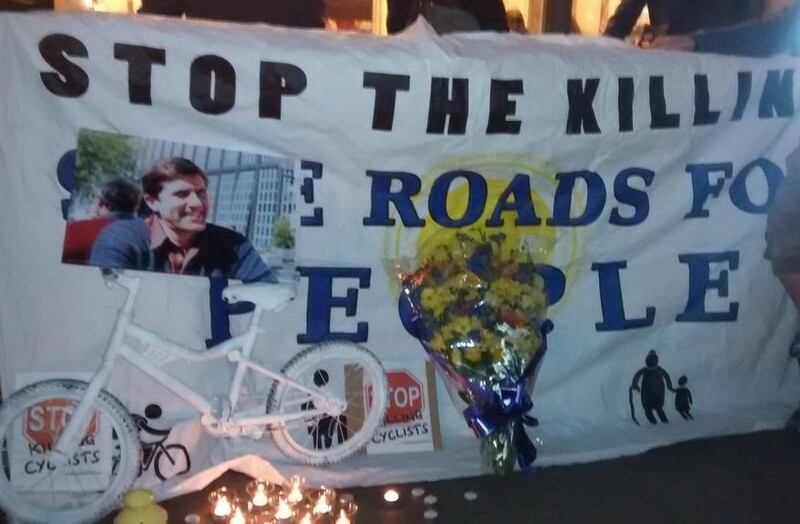 I spent my evening yesterday at the location of another road death, quietly contemplating with others all that is wrong with our streets and the miserable lack of UK road justice. The police chose not to charge the driver and didn’t consult with the Crown Prosecution Service (CPS) before making their decision. 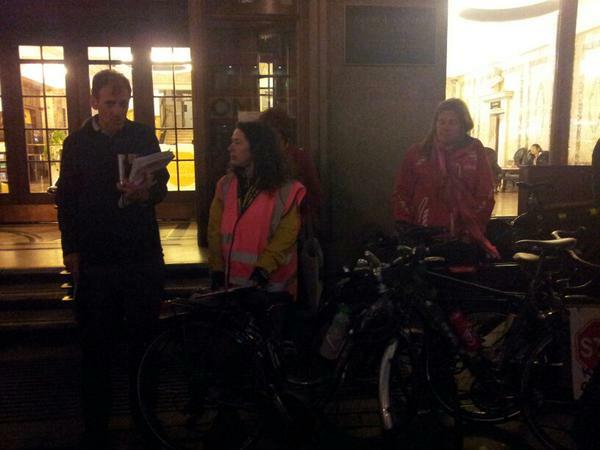 The event last night was organised by Stop Killing Cyclists and the Cyclists Defence Fund (CDF). 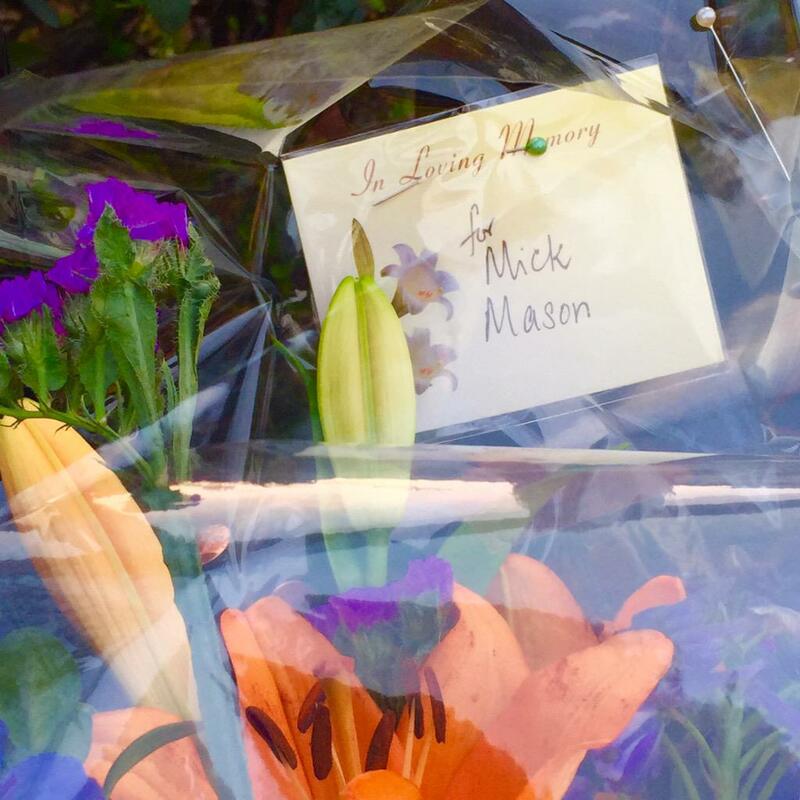 The latter are helping Mick Mason’s family to get answers from the police as to why they didn’t discuss the case with the CPS and are thinking about possibly carrying out a private prosecution of the driver. The CDF has launched a fundraising appeal to ensure there are sufficient funds in the event that a private prosecution is needed. Original Facebook event listing is HERE. Person on motorcycle confronts protesters. 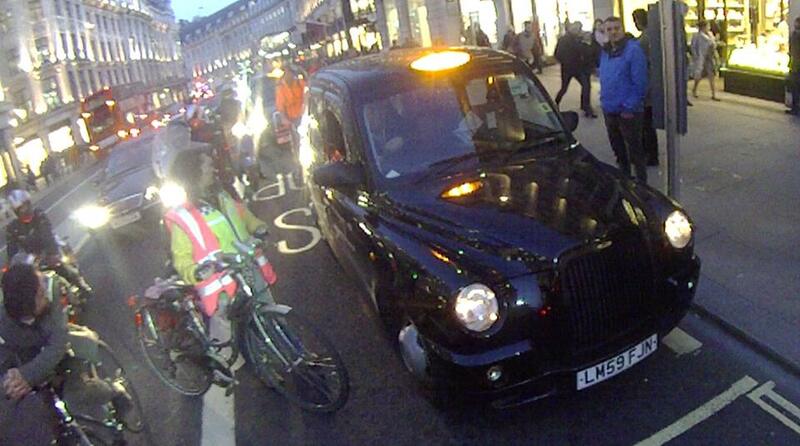 And thanks to that lady who tried to talk sense to the crazy LTDA chap.